Mr. and Mrs. Mallard are looking for a comfortable place to start their family. A place with no foxes or turtles, as Mrs. Mallard reminds her husband. So on they fly until they reach the Public Garden in Boston where they plan to spend the night. The next morning, after receiving a plentiful breakfast from park visitors, and finding no foxes or turtles, they decide the Public Garden is just the place they've been looking for to raise their family. Except for how busy it is! The people, and especially the boys on their bicycles, would be just too dangerous for a family. So they continue their journey through Boston, over Beacon Hill and the State House, past Louisburg Square, finally arriving at a peaceful island in the Charles River. There they raise their eight ducklings. Mr. Mallard leaves to explore more of the river and promises to meet Mrs. Mallard and the ducklings in one week back at the Public Garden. 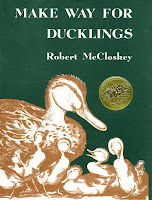 Mrs. Mallard teaches her ducklings everything wee ducklings should know, and in one week they begin their journey back to the Public Garden. They cross the river and a highway (getting help from Boston's finest, a policeman named Michael and other officers), head down Mount Vernon Street, pass the Corner Book Shop, turn onto Charles Street, and finally cross Beacon Street to arrive back at the Public Garden. Where they've lived ever since. Make Way for Ducklings is a classic any way you look at it. But after being in Boston and walking down the same streets as Mrs. Mallard and her family and riding the same swan boats they encounter in the Public Garden and actually seeing Mrs. Mallard and her family, this one will be a classic in our family for a good, long time. Below you can see the bronze statue of Mrs. Mallard and her ducklings in Boston Public Garden, the State House (although the book's illustrations show no Celtics banner), the Swan Boats, and Mrs. Mallard with her family and a mysterious friend.